When you hear a story about the most fashionable front men in films, everyone’s favourite Double-Oh agent might spring to mind. From Sean Connery sporting his own tailor’s handiwork, to the Italian made-to-measure Brioni suits on Daniel Craig, James Bond is certainly one of the best-dressed characters on the big screen. But where would a well-dressed hero be without a well-dressed enemy? It’s only proper. Bond villains don’t just give the secret agent a run for his money with wits and combat; often, they’re the only other characters in the movie who stand toe-to-toe with Bond’s impeccable dress sense. Is this just for show, or does a Bond villain’s choice of attire reflect something more about the movie? Let’s take a look at the top ten Bond villains according to Screen Rant and dip into their wardrobes to find out. Portrayed by Christopher Walken in A View to a Kill, Max Zorin rocked the slightly-unnervingly-bleached hair do long before Skyfall’s Raoul Silva. Still, the look proved to be simultaneously slick and strange, and a stark contrast to Bond’s then-darker locks. But what Zorin had in utter madness, he didn’t show in his choice of garments. 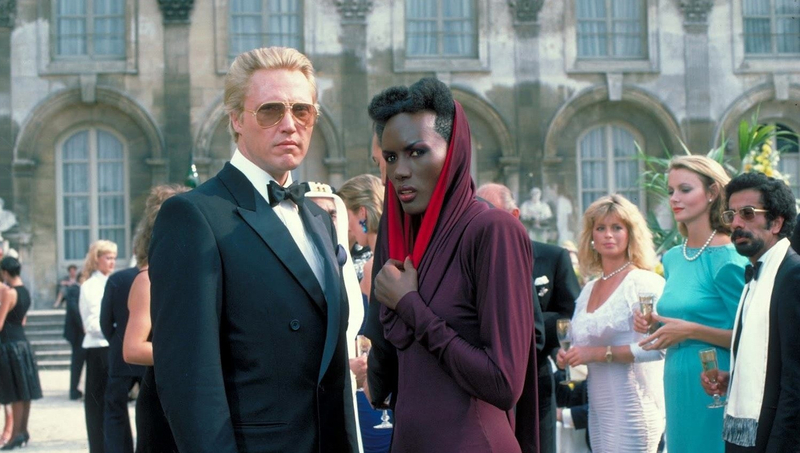 Although he sports a black double-breasted dinner suit in direct contrast to Bond’s white single-breasted dinner suit in a rather obvious show of opposites, Zorin’s general style is quite subdued and, dare we say it, normal. Could this have been the warning signs? It almost seems like the man is trying just a little too hard to look unsuspicious. You could, perhaps, draw the same feeling from Zorin’s accessories during the Royal Ascot scene, where the villain has a white carnation tucked in his suit lapel. White carnations are said to represent faithfulness and innocence, which certainly cannot be attributed to a man like Zorin, who is barely loyal to his own men. It’s still all about suave suits as we turn our focus to Dr. Kananga in Live and Let Die. The drug lord continues the Bond villain trend of being just as well-dressed as Bond, but with a few key notes that are just enough for the viewer to feel uneasy. Just like Max Zorin, there’s a sense of understanding in Kananga’s choice to keep a subtly-sharp dress sense, and he reserves his more outlandish attire choices when under the guise of “Mr. Big”. Mr. Big, a front for Dr. Kananga, spends the movie serving the purpose of distracting Bond from Dr. Kananga, despite being Dr. Kananga himself. From his bright red jacket choices to his later red-shirt and white-jacket combo, everything about Mr. Big is a bright, loud distraction. Some may say that the supervillain in Licence to Kill was more stylish than Bond himself. With Dalton’s Bond sporting some looser-fitting styles, Franz Sanchez also opts for the more casual tone, but with a decidedly more fitted air about him. This drug lord makes a few outfit changes throughout the film, from a blue suit jacket and white shirt combo, to a tan jacket and blue shirt choice. Interestingly, blue suits and grey suits are noted by some to be a good choice to send out a message of loyalty and dependability, highlighting Sanchez’s own value in those traits (and his paranoia of disloyalty in his men). There’s a lack of notable accessories in Sanchez’s style, unless you include the rather large iguana on his shoulder in some scenes. Dr. Julius No’s choice of style is rather plain and memorable as the ‘evil doctor’ trope. The unembellished, cream-coloured Nehru suit offers little other distraction, giving the doctor a sharp, efficient look befitting the villain. The Nehru jacket was notably once worn by those who had a high social stature, which is perhaps a sad reflection on Dr. No’s own back story as being an ‘unwanted child’. He has built himself into his own semblance of high status, despite his own perceived rejections. With his choice of cream and ivory, he sends us mixed messages – he’s the villain, but he’s wearing a colour linked to calmness and relaxation. Or, more interestingly, perhaps it echoes the idea of being in an ivory tower; that is, that Dr. No’s choice of garments shows how he feels he was rejected by the world. We can’t say that his appearance is totally plain though, thanks to his shiny, metal super-hands. With that death-grip of his, maybe buttons were out of the question when getting dressed on a morning. We often hear people describe Sean Bean’s depiction as Trevelyan as the dark version of 007, a sort of answer to the ‘what if’ wondering of the potential for Bond to go rogue. Playing on this portrayal, Trevelyan tends to stick to a very similar style as Bond, with a penchant for black suits and combat fatigues. He’s meant to match Bond in every way, both in intellect and in skill, having been trained the same way as Bond. Unlike other villains, this one’s obviously armed, and he knows all the tricks Bond knows. Everything is dark about Trevelyan – his jacket, his gloves, his boots, even his shirts only vary between black and grey. Bond usually has something to contrast within his clothes (usually his choice of white shirt). His mournful colour scheme could very well be a hint towards one of the former Double-Oh agent’s goals; to avenge the death of his parents. If you have the money, you can break the rules, right? That’s the vibe Le Chiffre’s suits give in Casino Royale. Although he wears the iconic ‘all black’ colour scheme of villains, his choice of quality that lends a few sly nods about his character. According to costume designer Linda Hemming, Le Chiffre’s choice of outfit is all about showing off without being noticed. He’s a man who wants to succeed without being seen, who wants his genius applauded, but not too loudly. These two desires would usually be at odds, but they make for a sleek suit of all black to hide away, but lavish velvet to show his wealth. Could really have a golden gun and charge $1 million per assassination without being a sharp dresser? It’s safe to say that Francisco Scaramanga has a strange sense of fondness for Bond, and more than a drop of rivalry and desire to prove himself the better killer, and it reflects in his clothes. His outfits seem determined to state ‘anything you can do, I can do better’, from his shiny choice of firearm to his slick white suit. Interestingly, Scaramanga meets his demise in China, where white can be seen as the colour of death and funerals; coincidence, or foreshadowing? Three main features stand out about Silva. That suit. That hair. That shirt. Worn by any other character, Silva’s loud, printed shirt and cream jacket would look eccentric. Coupled with the bleached blond hair harkening back to previous Bond villain Zorin, you’d be forgiven for calling this a fashion disaster at first glance. But on Silva, it serves its purpose in sending out a loud message: I am the villain. I’m not quite stable on any level. I thought this shirt was a great choice this morning. This villain again is a fan of contrasting Bond. Yes, he’s wearing a suit as Bond does, but it’s not by any means well put-together in a traditional sense. The colours contrast Bond’s usual go-to darker shades, the addition of prints is very anti-Bond, and it almost seems like Silva is mocking Bond on every level. That’s certainly the message the rogue former agent is going for, as his entire scene wearing this suit is played out as a mockery of Bond. At this stage in the film, Silva does not think Bond is his equal in any way, and he’s letting him know it. Not only does Silva feel confident that he has outsmarted Bond, he thinks he was a better agent, a smarter man, and a better shot. In the later scenes of the film, when the two men finally fight on equal ground, we see Silva switch to darker shades and combat gear more akin to Bond’s own look, as he finally starts to admit Bond’s given him a run for his money and forced him to step out from behind his henchmen and get his hands dirty. Quoted as saying, ‘No, Mr.Bond…I expect you to die.’, Goldfinger was a character with sharp wit and a sharp fashion sense. And, if you’re a fan of gold, then you’re going to love Auric’s penchant for gold-coloured everything. Dressed in silk suits or woollen golfing attire, you can be sure there’s going to be a shade of gold or close-enough-to-gold brown somewhere on this villain’s garment choices. According to Color Meanings, wearing too much gold can give off a sense of ‘being miserly, unkind, lacking generosity and kindness or being over-ambitious’. Check, check, and check. Could there be a deeper, underlying issue behind this? Probably not. The man’s called Goldfinger. He killed a woman by dipping her in gold. Sometimes, a man wears gold because a man likes gold. Granted, if you make it through one Bond film as a villain, you must be doing something right. Bond’s frequent enemy, Blofeld doesn’t prescribe to the usual ‘your suit, but better’ look many Bond villains go for. No, Blofeld is a villain who is quite happy to be utterly different from 007, from manner to fashion. An iconic look of Blofeld is his Mao suit, worn in a boring shade and echoing the rather listless shaded Nehru jacket worn by Dr. No before him. In fact, Blofeld’s most recent incarnation, portrayed by Christoph Waltz, would go on to sport a Nehru jacket of his own. Apparently, the new Blofeld’s simple outfit was to ensure all the spotlight for his menace were firmly on his mind, not his physical look. Here is a villain who isn’t going to beat Bond with guns or fists, so he doesn’t need to frighten or intimidate with his look. He isn’t required to engage Bond in a battle-of-the-suits, and more importantly, he doesn’t care to. About the Mao suit, there’s been many commentaries on the Bond villain’s choice of clothing, with many people quick to point out the link between Mao suits and Communism. BondSuits.com keenly points out, however, that Blofeld wears a decidedly western white cuff shirt under his Mao jacket, showing his ties to the East aren’t wholly strong. This article was brought to you by fitted men’s shirts retailer CT Shirts.